This proposal is based on the idea that restorative justice practices can be used in schools, particularly in classrooms, to help create a culture of care. In the field of a culture of care, research shows that there needs to be a sense of school connectedness and caring and nurturing relationships between the teachers and the students so that there can be an increase in the students’ positive experiences of schooling and a movement away from zero-tolerance punishment strategies. I propose that 20-25 educators and those interested in education be invited to participate in Restorative Justice in Education: Using Restorative Practices to Support a Culture of Care professional development training. This training consists of 16 modules. Each module would last 1.5 hours for a total of 24 hours of professional development training. Generally this training is offered over four consecutive days. This training will be facilitated as a training-the-trainers professional development training. Participants will be asked to successfully complete the following 16 modules constituting that training. Following is a list of each module, a brief explanation of the content, and the research that supports the module. Also attached as Appendix A is the pedagogical model for the training. 2. Basic principles – Restorative basics: It’s about attitude, doing school “with” students, inclusive relationships across the school, teachers positioning and theorizing; involving all staff. Cavanagh, T. (2008). Schooling for happiness: Rethinking the aims of education. Kairaranga, 9(1). 20-23. 3. Collegial relationships – Collegial relationships at work: Restorative tools are used to build and maintain a healthy community among leaders and staff. Cavanagh, T. (2007). Focusing on relationships creates safety in schools. set: Research Information for Teachers, 1. 31-35. 4. Teacher-student relationships – Restorative tools are used to build and maintain a healthy classroom community among teachers and students. Cavanagh, T., Macfarlane, A., Glynn, T, and Macfarlane, S. (2010). Creating peaceful and effective schools through a continuity of caring relationships. A paper presented for the Peace Education Special Interest Group (SIG), Expanding the Vision, Theory, and Practice of Peace Education in Diverse Contexts session, at the American Educational Research Association Annual Meeting, Denver, Colorado. 5. Building capacity – Restorative language and conversations: Simple, non-adversarial, problem-solving conversations. 6. Restorative conversations – Simple, non-adversarial, problem-solving conversations. Cavanagh, T. (2009). Creating schools of peace and nonviolence in a time of war and violence. Journal of School Violence, 8(1). 64-80. 7. Community circles - A semi-formal tool to help teachers and students build connectedness and cooperation. 8. Restorative circles - A semi-formal tool to help teachers and students respond to wrongdoing and conflict as a group. Cavanagh, T., Gaebler, F., & Zimmerman, T. (2008). Creating and maintaining a peaceful environment in elementary schools. Retrieved from http://www.educatingforpeace.chhs.colostate.edu. 9. Pre-conference – Pre-conference: Prepare students, staff, and parents so everyone knows the story of what happened before the conference, and they know the conference format. 10. Conference – Restorative conferences: Formal conferences to address specific incidents of serious harm; facilitated by trained people. 11. Agreement – Agreement: Specific plans to put right the harm that’s been done, including personalized ways for students to learn new skills/attitudes to avoid future trouble; allows for easy monitoring and follow up. 12. Classroom conference circles – Classroom-conference circles: Structured problem solving circles for large group of students and their teachers. 13. Brief restorative conversations for administrators, deans, and counselors – Brief restorative interventions: Referral-based problem solving tools for administrators, deans, and counselors. Cavanagh, T. (2012). Building the capacity of students to be peaceful citizens by implementing a culture of care in schools. A paper presented at the Policy to Arts, Engaging K-12 Students in Peace Education Roundtable Session, hosted by the Peace Education Special Interest Group (SIG), at the American Educational Research Association (AERA) Annual Meeting in Vancouver, British Columbia, Canada, April 13, 2012. 14. Brief restorative interventions for teachers and students – Brief restorative interventions: Problem solving tools for teachers and students. Cavanagh, T. (2003). Schooling for Peace: Caring for our Children in School. Experiments in Education, 31(8). 139-143. 16. Action plan – Using the process of Appreciative Inquiry, what steps could we take to move from where we are to where we could ideally be in creating a Culture of Care based on Restorative practices? Patton, M. Q. (2003). Inquiry into appreciative evaluation. New Directions for Evaluation, 100 (Winter). Participants will leave the training with the knowledge, skills, and resources to implement what is learned and also to teach others about what they have learned. In that way a professional learning community will be created in the Northern Arizona Academy focused on implementing restorative justice practices in classrooms in an effort to create a culture of care in the classrooms of the Academy’s two campuses in Winslow and Taylor, Arizona. The cost of this training is $6,000, plus expenses. The model for facilitating this professional development training is the “wheel of learning,” created by Dr. Peter Senge and his colleagues in The Fifth Discipline Fieldbook. This method includes the process of reflecting, connecting, deciding, and doing. The four areas constitute the different learning styles of adult learners. The result of using this model is to reach each participant’s learning style. The reflecting stage gives the participant an overview and a big picture of what is to be learned. Participants can then reflect on what this means to them. In this stage the facilitator’s role is to motivate the learners to want to learn. The learners may be utilizing personal reflections, writing, drawing, and discussion. The connecting stage of the process is the content area. Learners are given the information pertinent to what is to be learned. This step reflects traditional classroom learning. In this stage the facilitator is the giver of information. The participants are involved in analyzing, clarifying, reasoning, connecting, and defining. In the deciding stage the learners are involved with a hands-on activity to apply what they learned. The instructor assumes the role of coach and facilitator in this step. The participants engage in demonstrating, field testing, and experimenting. The doing stage involves implementing the learning into daily life. The learners are encouraged to apply their learning and report the results back later, at which time the “wheel of learning” will begin over. The facilitator assumes the role of evaluator and remediator in this stage. The participants are engaged in creating, sharing, implementing, and collaborating. Senge, P.M., Kleiner, A., Roberts, C., Ross, R. & Smith, B. (1994). The fifth discipline fieldbook: Strategies and tools for building a learning organization. New York, NY: Currency. Cavanagh (2009). 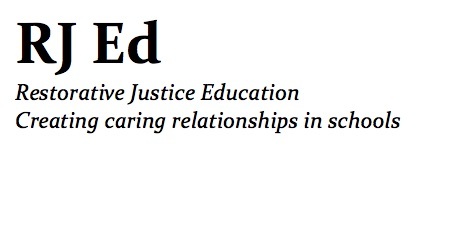 Creating a new discourse of peace in schools: Restorative justice in education. Journal for Peace and Justice Studies, special issue on Restorative Justice, 18(1&2), 62-84.